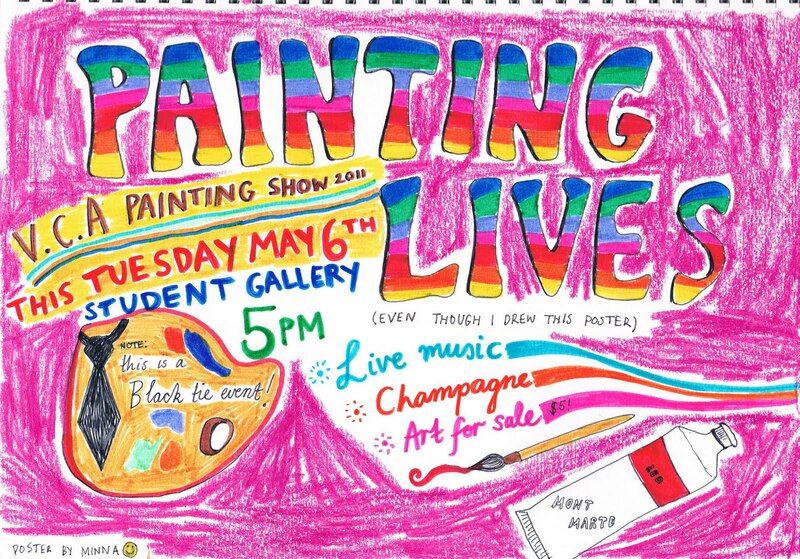 This Tuesday night the 3th of May is the Victorian College of the Arts painting department show. We've all been making posters to advertise it and this is one of mine (I also made a mistake on it, so great. This Tuesday is the 3rd not the 6th). The show actually has a concept this time which has not happened in all my time at VCA - we have each been issued with an identical sized piece of MDF board and, because we are the painting department and all - we MUST paint on it. The painting department is renowned for basically being the 'anti-painting' department, so we just want to REMIND everyone that we CAN paint and painting is as alive and wonderful as ever! Everyone is welcome to this show, it's going to be great fun with live music, champagne, food, and of course our painting endeavors will be for sale, $5! (I really should actually paint mine now...) Hope to see you there at the VCA Student Gallery - School of Art, Gate 4, Dodds Street, Southbank, Melbourne, Australia, The World, The Universe.